Lisa Vinikoor came to the Jewish Organizing Fellowship program when she was 29 after working for 4 years as a public school teacher in the Merrimack Valley. She left teaching because she was frustrated with how many deep systemic problems there were and how powerless she and her students were to change their community. After her Fellowship, Lisa returned to the community she had been teaching in to organize with the Merrimack Valley Project (MVP) a group of faith congregations who have come together to promote the welfare of their region. They are currently organizing homeowners, tenants and their allies from churches and the neighborhood to fight banks that are foreclosing and kicking people out of their homes. Lisa and her leaders are doing everything they can to stop foreclosures. They’re organizing “know your rights” workshops and trainings. They’ve held prayer vigils at churches and at peoples’ homes that are being foreclosed on and are drawing attention to the issue with press conference and action meetings with bank officials and elected officials. The training Lisa got through the Fellowship and at her placement the Greater Boston Interfaith Organization is helping her make sure that other kids like Luis, Natalie and Hector aren’t evicted. 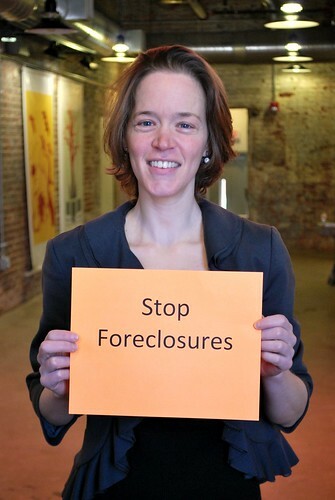 Lisa Vinikoor is fighting to stop foreclosures. What will you fight for?